La Spark – Renault Z.E. 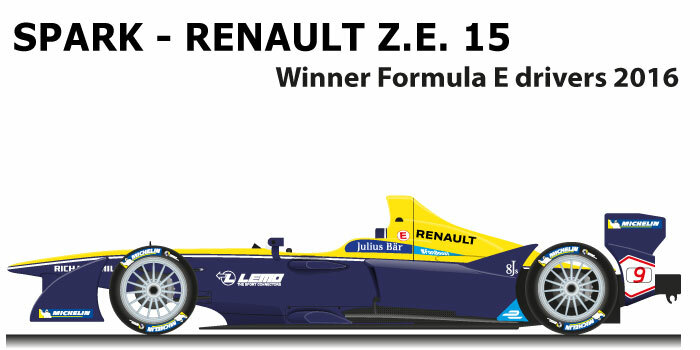 15 n.9 is the car that won the Formula E World Championship in the 2015/2016 season. In the second year of the electric championship the regulation of the supply of electric motors is changed, now the stables can build the engine on their own but the frame and the batteries remain the same for each team. Sebastien Buemi at the helm of Spark – Renault Z.E. 15 n.9 won the Formula E World Championship in the 2015/2016 season, winning its first drivers’ title. The Renault e.dams team driver fought the whole season with ABT Schaeffler from Brazil, Lucas di Grassi. The World Cup was decided at the last race in London where the Brazilian dammed the Swiss rider in the first corners and was disqualified. Buemi in season won three races: Beijing, Punta del Este and Berlin.